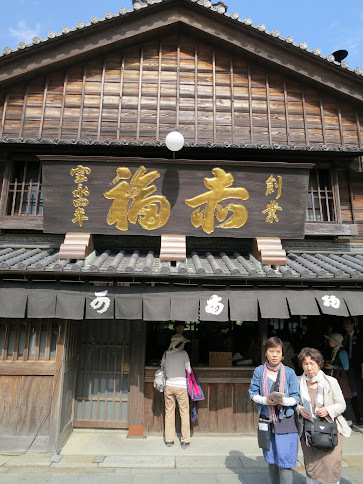 Ise Shrine in Mie Prefecture is probably one if the most sacred shinto site in Japan and it also has one of my favorite sweet, the famous Akafuku. While Akafuku or at least the boxed version is widely available in the Kansai area, enjoying the original is a must and a necessary stop on any pilgrimage to Ise. So just line up! When you walk in, the smell of freshly roasted tea welcomes you. Line up at the counter and buy a ticket. When you have a ticket, just move to the back. On your way to the back of the shop, you can see a bunch of ladies preparing fresh Akafuku. Just find a seat and wait for a lady to pick up your ticket. The river view is really nice. The fresh Akafuku is just hand made perfection! I had the boxed version many time which is good, but the fresh version is worth the trip alone. The red bean paste is so light and sweet. The main Akafuku shop has a beautiful garden. 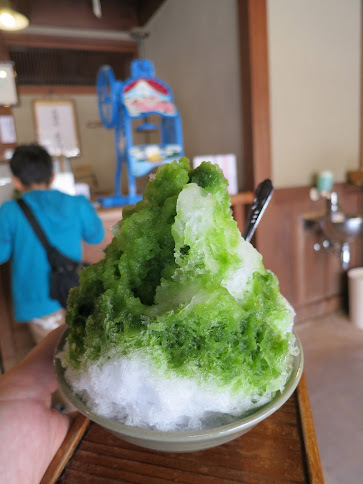 If you still have a bit of stomach space, try the Akafuku shaved ice which is sold right across the street. It’s only 500 yen and it has some good mochi and bean paste hidden under the ice. Choices of sweets in Ise are plenty, but don’t skip on Akafuku.